AURA HH is a wonderful human hair hairpiece very light totally hand-knotted. The front side is well-refined with ultra thin monofilament that adapts perfectly to the shades of the skin becoming invisible. On the back side elastic seams allow you to adapt size and shape of the cap. 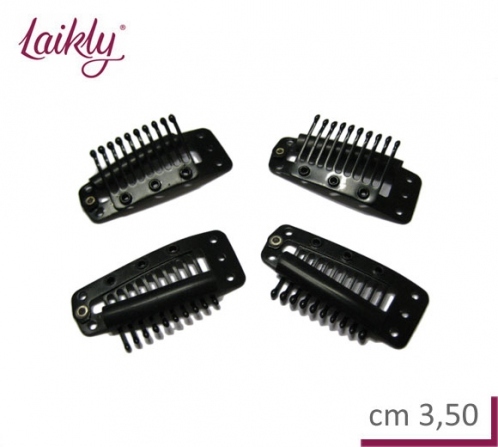 At the base there are 3 clips that allow to fix easily and quickly the hairpiece to own hair. A stripe of soft transparent polyurethane inserted in the front side allow also to apply a double-sided tape in order to guarantee a secure wearability! AURA is available also in the version with synthetic hair click here to see it. Wet it gently with TEPID water, holding it with a hand within the cap, using a shower head if available. Apply a small quantity of neutral shampoo (we recommend "Shampoo P.E.+S") and comb delicately, WITHOUT TANGLE THE HAIR. After that rinse well the hairpiece with TEPID water without wring out, continuing brush it with a large-tooth comb. Repeat washing and rinsing a second time proceeding as above described. To keep the hairpiece bright and soft we suggest you to apply a gentle hair conditioner for treated hair on the lengths (in the section "Accessories" you find for example "Conditioner P.E.+C") continuing to brush hair delicately. Let the conditioner act for 5/6 minutes. After that rinse the hairpiece well with TEPID water without wring out, continuing brush the hair. Wrap the hairpiece in a soft towel delicately in order to remove water in excess without rub it. Concerning hairpiece's drying you can proceed in two ways: let the hairpiece dry at the air at room-temperature leaning it on a polystyrene head, or you can dry it with hair-drier giving to the hairpiece the desired style. Brush the hairpiece with a large-tooth comb always with maximum gentleness to avoid to slacken hair knot. You can use hair products in minimum quantity. In any case we advice against applying hair spray or hair mousse or other products that contain gas, alcohol or other aggressive ingredients. DON'T sleep wearing the hairpiece. Comb your hair gently with a large-tooth comb together with them of the hairpiece and amaze final effect!